A twisted knee is a common problem that can cause damage to the ligaments and cartilage in the knee. It often results in pain and swelling, instability and limiting function. The most serious twisting injuries usually occur during sporting activities where the combination of speed, sudden changes in direction and contact tackles result in injury. This is especially the case when wearing footwear with studs/cleats such as in football or rugby, or skiing, because the foot can remain fixed to the ground while the leg rotates, overstretching and twisting the knee. Twisting of the knee may damage one or more of the four ligaments and/or cause pinching on the cartilage/meniscus which may result in a tear. Here we will look at the most common injuries associated with a twisted knee, how they happen and how to treat them. Let's start with a brief overview of the different structures in the knee to see how over-twisting results in injuries. The structures most commonly injured with a twisted knee are the ligaments and the meniscus. 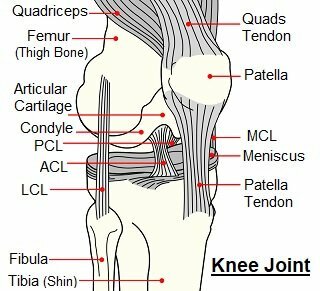 There are two pairs of ligaments that control the stability of the knee joint. The collateral ligaments (medial and lateral) are found at the sides of the knee joint and control the side to side stability of the knee. The cruciate ligaments (ACL and PCL) are found inside the knee joint and control the forwards and backwards motion of the knee. Lining the knee joint on top of the shin bone (tibia) are two specially designed, crescent-shaped pieces of extra thick rubbery cartilage, known as the meniscus. They provide cushioning for the joint and allow the knee to move to smoothly. Let’s find out some more about each of these. When the knee twists too far, one or more of the ligaments may be placed under too much tension and as a result over-stretch. This is known as a knee sprain. There are three different grades of sprain depending on the severity of the injury. The medial and lateral collateral ligaments sit on the sides of the knee joint, the medial collateral ligament on the inner side (closest to the other knee) and the lateral collateral ligament on the outer side of the knee. The medial collateral is more commonly injured and tends to happen when there is a force through the outer side of the knee which pushes the knee inwards over the foot. 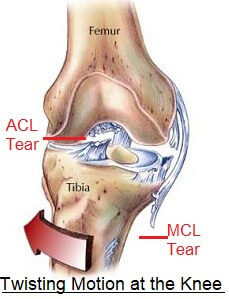 MCL injuries are also a common skiing injury, particularly in beginners as the snowplough position places tension on the medial collateral ligament which may become too great during a fall if the knee drops in while the foot/ski goes out. Lateral collateral ligament damage occurs when there is a force through the inside of the knee pushing it outwards and therefore placing a strain on the outer side of the knee, overstretching the ligament. Injuries to the lateral knee ligaments are less common as the other leg provides a barrier thus protecting from this type of injury. The cruciate ligaments control how much the knee bones glide forwards and backwards so are often overstretched with a twisted knee. 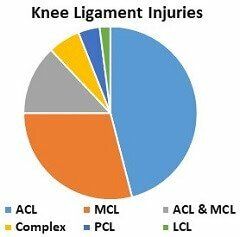 The ACL is the most common knee ligament injury. An over twisted knee is the most common cause of ACL damage, usually from changing direction or pivoting quickly when running. It can also be damaged during sporting tackles where the foot is stuck to the floor and the shin bone is pushed inwards or backwards too far. 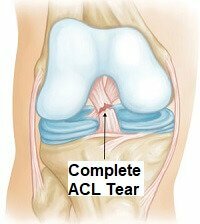 The classic signs of an ACL knee ligament injury are immediate pain, swelling (within a few hours), an audible pop and the knee giving way. If you have twisted your knee in the past and are having ongoing problems with knee instability, there is a good chance you damaged your ACL. These occur far less often with a twisted knee. The PCL is more commonly damaged when the knee bends back too far rather than from a twisted knee. Symptoms of PCL injuries tend to be quite mild, and as such these injuries often going unnoticed. There tends to be an ongoing feeling that the knee “isn’t quite right”. 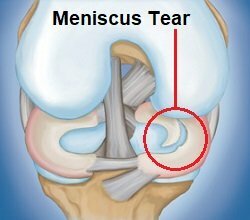 The knee meniscus is prone to getting squashed and torn with a twisted knee. The most common way it is injured is when the foot is fixed to the ground, the knee is slightly bent and the knee twists suddenly, either as you change direction or as you are tackled. The meniscus has a poor blood supply so healing is slow. It is most commonly the medial meniscus on the inner side of the knee that gets damaged as more force goes through the inner side of the knee. Common indicators of a cartilage injury following a twisted knee include pain when walking or straightening the leg, swelling (usually within 48 hours) and in some cases locking, where the torn fragment of cartilage gets stuck in the knee joint preventing movement. Often with a twisted knee, more than one structure is damaged. It may be that more than one ligament is damaged, most commonly the ACL and MCL, or that there is a combination of ligament and cartilage damage. It is even possible to damage three structures. 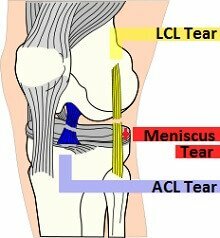 The most common triple combination is the ACL, LCL and Meniscus, known as O’Donoghue’s Unhappy Triad. Complex injuries where multiple structures are damaged are obviously more serious and recovery is likely to take longer. Immediate treatment for a twisted knee follows PRICE principles. Further treatment will depend on what injury has resulted from your twisted knee – you can find out more about the best treatments for specific injuries using the links above. If you have twisted your knee and are suffering from pain and/or swelling, follow these principles (find out more in the PRICE treatment section) and get checked out by your doctor. If none of these meniscus or knee ligament injuries is seeming quite like your problem, visit the knee pain diagnosis section for help working out what is causing the pain.